An Icon Painter in Venice (Advanced) – In this activity, students look at three paintings by El Greco, who was initially trained as an icon painter in his native Crete. He studied Western-style painting in Venice and Rome before moving to Spain. The artist probably painted two of the works under discussion while he was in Venice. How Does That Strike You? (Elementary / Intermediate) – In this activity, the class creates word clouds for three devotional pictures: one Madonna in the Byzantine style and two others created by Giovanni Bellini and Raphael. Icon vs. Iconic (Elementary) – This activity is a classroom discussion about what we mean when we use the words icon and iconic today. 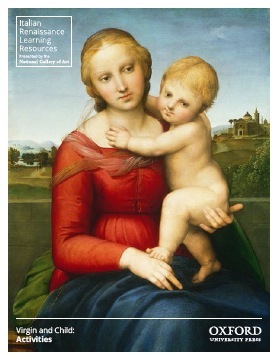 Sign and Symbols (Elementary / Advanced) – In this activity, students research the iconography commonly employed in Renaissance images of the Virgin and Child. Portraits and Devotional Pictures (Intermediate / Advanced) – In this activity, students compare portraits by Giovanni Bellini and Raphael to the “portraits” they painted of the Virgin. The Procession (Intermediate / Advanced) – In this activity, students explore the spectacle and public role of devotional images in Florence. Specifically, students will imagine what it would be like to participate in or witness a public procession of the Impruneta virgin or another devotional image they research and identify.